A paper read by Miss Ethel H. Forbes, prize essayist of the Brookline High School in 1914, at a meeting of the Brookline Historical Society at the Edward Devotion House, December 17, 1914. Although it may seem hard to realize, men, from times long, long ago have more or less worshipped fire. Sometimes it is reverenced in a sense of warm friendliness, when on a cold winter's night the glowing hearth is enjoyed; but quite as often with awe and fear, when the bell is heard ringing and engine dash through the streets. Fire fighting is not far away from fire-worshipping, and with this in mind I am going to write of these fighting organizations and the work they have done for us. The very first fire department in Brookline was started in 1784, and was made up of ten men who volunteered their services. The only equipment they had was a piece of apparatus which was not much better than a watering can. In 1787 a new engine was purchased and kept in a small house 10x14, in Punch Bowl Village. In this company there were eight men, seven belonging to Roxbury and the other, Joseph Davenport, was the only Brookline representative. About the first that was heard of this company's work was at a great fire on Milk Street, Boston, in 1794, when they rendered their own services as well as that of the fire engine. We do not know what the expenses of the town were then, but they couldn't have been much, as is shown by a record of a town meeting in 1795, which tells us that Brookline was to pay half the cost of repairing the fire engine. In 1797 a new one, which was nothing more than a box with a force pump and brake to work it, was purchased for thirty dollars. The water had to be brought to it in pails and poured in, when it was forced through a pipe, the hose not having been heard of at that time. The next we hear of the fire department is the mention of the election of Firewards in 1799. These men had for a badge of office a long red staff mounted with a polished brass spire. These probably did hard work as the expense of repainting them is in the early records. When there was a fire it was the duty of the Wards to take their badges and go immediately to the place, extinguishing and preventing the spread of fire, by tearing down houses if necessary, removing furniture, and if there was disorder, suppressing it. In 1800 the same men were re-elected, holding their positions two years. From this time till 1828 nothing is said of the fire department, save the purchase of a new fire engine at $400, the money being raised from citizens of Brookline and Roxbury, by popular subscription. This engine was a great improvement over the old style as it was supplied with a hose and more buckets. There being some thirty dollars left after the apparatus was paid for, it was decided to have a new house in which to keep it, so a building was erected on the spot where Scarry's store now stands. In those days the Engine Company was as much a social organization as it was fire fighting, and the "Norfolks" probably gathered as often in the Punch Bowl Tavern as they did in the fire house. In fact, this company was to the people of the day what clubs, libraries, lectures, etc., are to us in this time. Very careful records of the Norfolk Company have been preserved, and from them one would gather that next to the engine, the constitution and by-laws were most important. As the companies usually changed annually, there were a great many constitutions, or amendments, revisions, etc., to the former one, the new company thinking the others not good enough. The Punch Bowl department was enlarged in 1831 by a piece of apparatus which had long been needed, a hook and ladder. It looked little like the fine auto we have to-day, but such as it was, it served the purpose. The next year a harness and collar were sold in order to obtain money to buy a trunk in which to keep bills and records. The former have long been out of existence, but the latter have been carefully preserved. Feeling that the small house was no longer suitable for the needs of the fire department, a committee was chosen in 1834, to send a petition to the Selectmen "to enlarge the house and have a kettle," the last mentioned probably for the famous chowder which the citizens of Brookline enjoyed through the hospitality of the company. For some unknown reason in June of that year, there was a disbandment, and resignations were sent one after another until there was nothing left of the department. However, a new set promptly organized, made a new constitution, but left no records probably on account of its short life, which ended in 1835. It was not long before a new company formed, which was more or less inclined on the social order. In 1836 a hotel supper was given by them at Brighton, at which a letter containing twenty dollars was received by the company from James Leeds, Esq. The clerk of this organization, Elisha Stone, evidently had too many other duties to attend to, among other things collecting taxes, acting as sexton, bellringer and constable, being undertaker, etc., for little record is left of their endurance. At a town-meeting in 1839 there was much discussion as to what would be done with the old fire engine. It did not "fill the bill," fora suction engine which was what was really needed in order that a better stream of water might be made available. At this meeting it was also decided that the engine should be owned, not jointly with Roxbury, but independently. Therefore, a new piece of apparatus was obtained for nine hundred dollars, the old one being sold for $197.40, $147.40 going to Brookline and the remaining $50 to Roxbury, these sums being in proportion to the amount given by subscription in 1828. Having a new constitution and a set of by-laws, beside the engine, Brookline Engine Company No. 1, consisting of thirtynine members, was formed in May, 1839. There being few fires, there was a marked pronunciation in the social life again, which in 1841 led to disbandment. Oliver Whyte, Jr., Hugh M. Sanborn, John W. Blanchard and others framed another constitution and took their places in Brookline Engine Company No. 1. When there was a fire, it was customary to ring the bell on the Baptist church, but the deacons and some members of the congregation refused to let it be rung when a meeting was being held. Consequently the following report on June 20, 1843: "An alarm of fire was given this eve at 1/2 past eight. There was an attempt to ring the bell but the proprietors of the church (as there was a meeting in the vestry) dispatched their infatigable sexton, Mr. Luther Seaverns, to allow no one to ring to bell. The fire was on the old Porter Estate in Cambridge near the College." 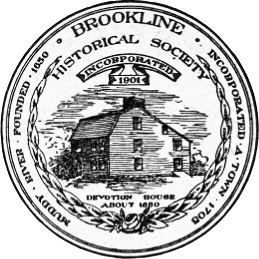 "Resolved, that the thanks of this society be extended to the Brookline Engine Company No. 1 for their attendance at the anniversary of our Society and that we hail with pleasure the glorious example which they have set in uniting themselves in the great and glorious cause of Temperance." Evidently this proved too much to the company, for at their next meeting they disbanded. The company following this one was a rather unfortunate one, for in Sept. (1843) the engine house was burned to the ground, the engine in a bad condition however, being saved. The apparatus had not had time to be repaired when a large fire broke out in Boston, to which the Brookline department was called. Thinking it advisable to render all the help they possibly could, the unfortunates went, their services being of great value. While the engine was being fixed this company fell to pieces and for a short time little interest was taken in this department. In the latter part of the year, forty-nine citizens of the town volunteered to do their best to guard against fire, so the difficulty of not having a fire department was done away with. It was this organization which decided the engine had better be drawn by horse power, than for men to draw it all over and sometimes out of the town. Next year a new engine house was built on Washington Street, where the present headquarters are now located, and which cost the town $2,901.41. With the new engine house a new company, calling themselves the "bone and muscle" of the town, procured for the house a bell, and a sign on which was printed the name of the engine. Very interesing records were left by the clerk of the "bone and muscle," one of them reading: "Apr. 30, 1845. About 8% o'clock on Wednesday evening, a fire was seen in West Roxbury or Dorchester, about five miles distant. The company (without a horse) was the second to reach the spot. Returned at 12." Another one reads: "August 19, 1845. Tuesday noon at 2 o'clock an alarm of fire from some unknown land. The company ran to the railroad in Roxbury and found themselves no nearer the fire than at starting." This company did excellent work while in Brookline, No. 1 giving good assistance at a $100,000 fire in the Roxbury Iron Co., and at the Brook Farm, West Roxbury. In 1846 a great deal of zest was added to the organization, through a canvasser who circulated a paper asking for thirtyfive or forty men to join the department, as a "large gang" was needed in order that the hand engine could be used successfully. Fifty new names were added and with them a new history had its beginning, one of the first things they decided being that unless very necessary, they would not attend fires outside of their own town. As it happened there were very few fires in Brookline, so much attention was given to social life. On one occasion the Selectmen of the town were invited to a "company chowder," and in the record we find, "The chowder was then attacked as though we were half starved - and such a chowder, as fit to his Majesty, the best ever made in Brookline." The next year much trouble arose over the temperance question, and from this much discredit was gained by the firemen. On one occasion refreshments, being described as "liquid, something carried in a bucket and which smelt very strong of brandy," were served after a fire. The bill for this, $13.75, was disapproved by the Selectmen. The disapproval made most of the company very angry, and after a meeting, the men raised the flag on the engine house half mast, with the union down, thus showing their disrespect for the Selectmen. Naturally these men discharged some of the officers and enforced stricter measures. In June, after a much heated argument, broken by a fire alarm, the company ran to Jamaica Plain, and on returning, disbanded. The next organization was composed of men appointed by the Selectmen, and who paid great attention to their work. Unfortunately, when the "Green" house on Pleasant Street, and the "Harris" house on Harvard Street were burned, there was much unnecessary loss due to an insufficient supply of water. Shortly after this the present water supply was installed and a hydrant was placed in the village. The next year a "hydrant company" was formed to take charge of the hydrant at all the fires. In 1849 thirty dollars from the funds of the company were expended in ornamenting the newly repaired engine, a motto, "Our aim the public good," being printed on the side. In September, 1850, a large fire occurred at the home of Col. Perkins. For their good service, a present was sent to the company by Col. Perkins. From 1848-1851 a number of fires were set in Brookline, the Selectmen's records showing rewards offered for the rescue of the culprit. Special watchmen were appointed and shortly, arrests and one conviction were made. In 1852 two men received two hundred dollars for arresting Thaxter Prouty, who was convicted of setting fire to a barn owned by Thomas N. Woodward. In 1832 it was voted by the governing body of the town to appoint a committee to obtain a fire hook and ladder, and also oilskin suits for the firemen. Three years later the Hook and Ladder was bought from Roxbury for $230, and this apparatus was used for twenty years after. At the cost of $1,694.41 land was provided, and a new house for the truck was built there. This same year there was a serious fire at the Catholic Church on Station Street. Great praise went to the Engine Company, who not only saved the church from utter destruction, but also saved much property of value in that district. For the next five years little was done, as there were few fires and no real department. Official approval by the Selectmen was given an organization in 1860, the clerk being W. Y. Gross. At a fire on White Place one early June morning of that year, the clerk was severely injured, and in order that they might show their appreciation, his fellow-comrades paid his fines while he was disabled. During this year there were many fire alarms, and one of the most interesting was one on Nov. 12 at 8 p.m. The bell on the Unitarian Church rang, celebrating the election of Lincoln, but the firemen ran way up Boylston Street before they knew the reason for the alarm. In August, 1862, a small sum, two dollars, was given to the fund for the dues of the fire officers who had gone to war, and the next month W. Y. Gross was presented with a revolver and given an honorable discharge. Three years later in order that the hook and ladder and extra hose might be cared for properly, the "Good Intent Hose Company" was organized, and in 1870 took its place in a new fire station at Village Square. In the report for 1871 the Selectmen recommended the town "to omit the choice of the Firewards" and have them appoint a Board of Engineers. By doing this, the department would be under a proper head and better results would be obtained. At a town meeting in 1875 it was voted that $7500 was to be appropriated for the fire department; also that a committee was to be appointed to consider the reorganization of the department, reporting on it after the water from the Charles River had been introduced. In 1877 a chief superintendent was appointed to operate the steam fire engine, and be responsible for hydrants, telegraphs, hose, etc. Not much more is heard of this organization till 1884 when we find everything in excellent condition, and no dangerous fires occurring. The report for 1885 shows us how the department had enlarged, there being forty-eight officers. It also called attention to the poor, clumsy way the fire alarms were given and asked that a telegraphic fire alarm be substituted. Two years later the telegraphic alarm was installed, from which much benefit has been derived, and much valuable time saved. This same year a new chemical engine house was built at Longwood, and two of the other houses were fitted with swinging harnesses. From this time to 1891 no new information was given in the reports and very few fires broke out. In that year we find the number of men in the organization at fifty. A new fire station was built on Chestnut Hill Avenue, and was occupied by Hose Company No. 3. In 1892 thirty new hydrants were erected, making in all 317 for the use of fire purposes. A new bell and striker was purchased and put on the new engine-house, which proved to be very valuable to the members of the department. An increase of seventeen firemen is recorded in 1897, and although what fires they fought were small, they did good service. In 1899 a new hook and ladder was purchased to replace the one which had been in service for twenty years. A new combination and chemical wagon was also bought and put in the Devotion Street house. Beside the engines, a new house was built on Heath Street and the combination hose wagon and chemical company took its residence there. At this time the number of hydrants had increased to 493. 1900 broke the record for the largest number of calls, 165 alarms being answered. This year a new combination was purchased and found to be a fine piece of apparatus. And so I might go on, enumerating the number of men added, engines bought, etc., but I am going over this to the report of 1908, when the fire commissioner recommended the purchase of an auto as they had proved so successful elsewhere. In 1909 the chief's runabout was put in service, and the auto combination A was received. In the next year's report, the strengthening of the department by the auto was recorded. The largest number of fires ever occurring in Brookline's history up to that time was in 1911. One fire of great loss was the Holtzer-Cabot Electric Co., the fire spreading over the building with great rapidity on account of the construction. Last year 272 alarms for fire were given, but with all the autos giving quick service, the up-to-date apparatus along other lines, and the large force of men, the Brookline Fire Department was fully capable of handling them.